When Jon Robinson met Jaimie Bivens at Nicholls State University in south Louisiana, it was 1999. She was a 19-year old student, and he was a 24-year-old football coach. “I was a bartender at the local family sports bar where all the coaches and everybody hung out,” she says. The two began dating, and when it was clear things were getting serious he wanted to make sure she was okay with the plans he had for his future — possibly becoming a head coach someday. It would not only mean leaving her hometown, but possibly her moving all the time. The Louisiana native was all-in on Jon and wherever his professional sports career would take them, and they got married in 2002. Just two months later he was tapped to be the local scout for the New England Patriots, and so began their crazy journey. Jon spent 12 seasons with the Patriots, working his way up from area and regional scout to director of college scouting — a promotion that required the family to move to Boston in 2009. In 2013 he joined the Tampa Bay Buccaneers overseeing all areas of the scouting department, both college and pro, in addition to free-agency prep and evaluating players in the NFL. Then two years ago they moved again, leaving Tampa for Tennessee when Jon was named general manager of the Titans. A year later he was promoted to executive vice president and general manager. Since their arrival they have been settling into life at the Governor’s Club in Williamson County — a welcome respite, especially during football season. The Robinsons are now a family of six, with two daughters, Taylor Brooke and Bailey Rae, and two Bouvier des Flanders dogs — Kai, and Dexter, just 4 months old. Jon is a native of Union City, Tennessee, so the move brought him and his girls closer to his roots. When choosing their home, they needed a space to accommodate all aspects of their life — family and kids and relaxation, but also hosting high-profile events. Open the doors off the downstairs bar to the pool, and the breeze that blows through is practically tropical. “It’s like we’re in a new part of the country,” Jaimie says. The girls love to swim in the summers, too, and Jaimie and Jon are happy to just hang out nearby. “That’s our happy place, to be down there and just relaxing, watching the kids swim,” she says. Also downstairs is a game room with pool table, a separate area for video-game play, and a media room with a custom wine cellar by Robert Hendrick of Rail Yard Studios. Along the walls where they watch movies are posters from every city they have lived in together — Boston, Tampa, Nashville. Jon golfs when he has time, and the girls and Jaimie will sometimes tag along. They go to the clubhouse for Sunday brunch and will even pick up dinner there to take home on occasion. “We just love the neighborhood,” she says. But the kitchen is the hub of the home, where purses are dropped, shoes are kicked off and homework is spread out over the expansive island. It also becomes a de facto hang for Jaimie’s friends and the monthly get-together she hosts for the players’ wives. The kitchen opens to the living area, and signs of life are everywhere — from the dog toys to the four-leaf clover one of the girls plucked outside on St. Patrick’s Day. The grey walls blend with the neutrals of the kitchen. Even the formal sitting area has been getting some love as Jaimie’s friends have encouraged her to move out of the kitchen to just relax and sit. 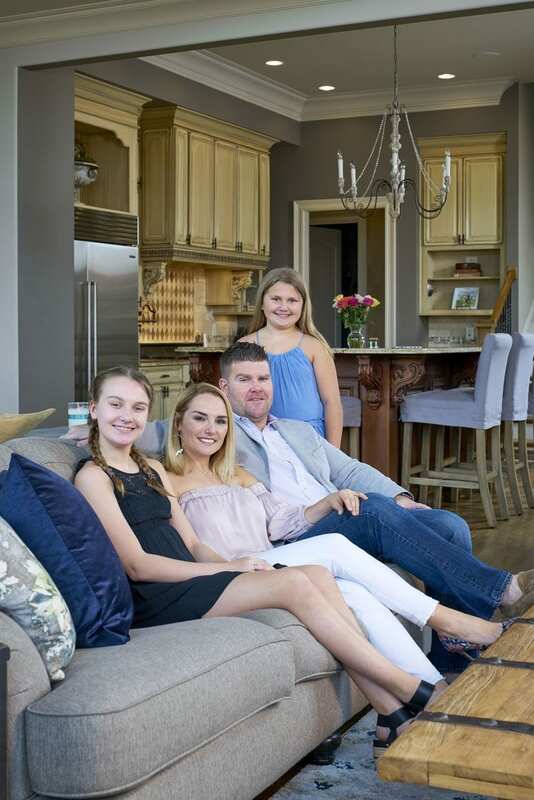 Kara Blalock of ReFresh Home helped the Robinsons with their family-friendly design, using a lot of their own pieces — even if it meant transforming them to work in the new space. She also reused a lot of the home’s existing light fixtures simply by swapping rooms so the styles and sizes better matched the space. And of course they took the kids and dogs into account, too, avoiding expensive pieces in delicate fabrics that wouldn’t stand a chance after a few years of family life. That doesn’t mean they shied away from some seriously standout pieces, like a dramatic light fixture Jaimie saw on ReFresh’s Instagram page. “It’s my favorite,” she says. And just underneath is one of Jon’s favorites, a custom table, also made by Hendrick of Rail Yard. Looking for something that was pub height, Jon found Hendrick’s work online and clicked on it, not even realizing Hendrick was in Nashville, too, at first. “We went through a lot of the emails back and forth on this thing, and he nailed it,” Jon says. Of course, Jon only has time to work on design projects during the off season.